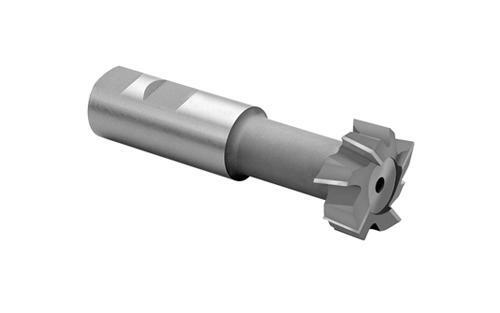 Maxwell T-shot Milling cutters are differentiated by the presence of both side and staggered teeth. They are available for right and left hand cut though the standard is right hand. The inclusion of the taper shank depends on the instructions you give when ordering. This feature is part of the specifications you give to the manufacturer. This cutter is used in machining portions of T-shaped slots to transform them into work pieces. Industry standards are followed when manufacturing these cutters. The standards dictate the size of teeth and quality of material. Maxwell uses ASP 2030, M35 and HSS M2 because of their quality. Maxwell has been producing both standard and non-standard milling and cutting tools for decades now. It has maintained a reputation for quality by using the latest technology in all stages of production. Each unit receives individual attention during production and is scrutinized afterwards to ensure that it meets required standards. The aim is to ensure that it does not result in discrepancies especially during mass production. Availability of readymade tools reduces delivery time. This means that your order will be shipped immediately after purchase terms are fulfilled. This does not rule out the possibility of customized cutters. A friendly online portal allows you to send specifications for the company to produce your desired dimensions of cutters. Reduction in the cost of maintenance considering that high quality cutters last long and thus do not require regular replacement. The technicians at Maxwell are highly skilled, innovative and experienced to deliver to your expectations. They are aided by computers in simulation to generate profiles based on the specifications you give. This gives you an idea of what to expect and offers a chance to make modifications before production. You will get the right cutter for all your operations. A resourceful and interactive website makes the process of ordering hustle free. It offers all the details you require including standard dimensions and prices. The fees are included with no hidden charges. This makes financial planning easy. You have an idea of what to expect and how much to pay before making the order. Maxwell services industries involved in paper cutting, gear and screw manufacturing as well as earth movers. The specifications for tools used in these industries are unique. This has led to the production of a variety of tools with unique properties. It takes the creativity and innovativeness of the technicians to meet the needs of each client. Customer experience is enhanced through reliable checkout systems and an elaborate mechanism to handle complains from customers. Return customers are not treated like first time buyers. Their profiles are also saved within the company’s database in case you need it. The team goes an extra mile to deliver beyond your expectations. The prices are very reasonable and competitive.